StoptheDrugWar.org needs your support more than ever before to continue our work of getting the word out online for the drug policy reform movement, building the movement, and providing this crucial informational tool that reformers around the world use in their work every day. I ask your support at this time with the most generous donation you can afford to enable this newsletter to continue. In recent weeks we've announced our latest offer for members donating $50 or more, author-signed copies of three important new books. Phil has now completed reviews of all three of these works, most recently NYT bestselling author Doug Fine's -- Too High to Fail: Cannabis and the New Green Economic Revolution, as well as Marc Mauer and Sabrina Jones's Race to Incarcerate: A Graphic Retelling and Carl Hart's High Price: A Neuroscientist's Journey of Self-Discovery That Challenges Everything You Know About Drugs and Society. Now, $50 is a little more than we've asked for such items in the past, and of course they can be ordered online or purchased in a bookstore for less. Things have changed in the drug reform funding scene, making our organization more dependent on membership to continue our programs -- I hope you'll choose to support us at this time. Note that we continue to offer a range of books, videos, and StoptheDrugWar.org gift items with donations of as little as $7 -- visit our donation form to see the full list. Also note that donations to StoptheDrugWar.org can be tax-deductible, supporting our educational work, or non-deductible, supporting our lobbying work. (Note that selecting any gift items reduces the amount of your donation that is deductible -- which with a smaller gift amount can be most of it.) 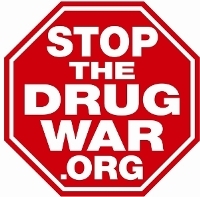 Donations can be made by credit card or PayPal at http://stopthedrugwar.org/donate, or sent by mail to P.O. Box 18402, Washington, DC 20036. If you are donating by check, please make it payable to DRCNet Foundation (if tax-deductible) or Drug Reform Coordination Network (if not deductible). If you wish to donate stock, the information to give your brokerage is Ameritrade, (800) 669-3900), DTC#0188, and account number 781926492 for tax-deductible gifts or 864663500 for non-deductible gifts -- please make sure to contact us if donating in this way. I'll say for one thing you're starting from the wrong point. A person sitting in that chair isn't thinking about how you're offering them a chance to get clean. They're thinking about how screwed up it is that YOU, another human being, are so heartless and full of yourself as to have the audacity to sit there and be a part of a system that could potentially do far more harm to their life than the drug (especially when we're talking about softer drugs like marijuana, shrooms, or LSD) that they are being prosecuted for possessing. They may want to get better, but they are angry They are angry that you're part of a system that has lied to them and their countrymen, and now you are forcing them to conform to their beliefs. You will never win a person over to your belief system by legally and institutionally forcing them to be a part of it. You can't make a person WANT to complete the program, because you are an impersonal suit to them. Because you are part of a system that has lied to them since they were kids and they know, so what credibility can you possibly purport to have? You may have good intentions, but being a player in the drug war has not and will not have a meaningful impact on anyone's lifestyle. If a person is going to change their choices, make "better" choices as you would say, they are going to do so through the support of their friends, family, religious community, school community, etc. Not because the law forces them to. The sooner you accept that you're starting from a fundamentally disadvantaged position (and drug prosecuter is about as disadvantaged as you can get), the sooner you can explore other avenues of helping people.